India’s largest foreign portfolio investor (FPI) increased its local stock bets at a significantly faster rate than the category as a whole did over the last 10 years. The EuroPacific Growth Fund had disclosed investments of less than ₹ 932 crore in March 2006. Its holdings have since increased by around 55 times to ₹ 51,564 crore at the end of June this year. Foreign portfolio investors as a whole have increased their India holdings by around six times to over ₹ 20.13 trillion during the same period. The growth in EuroPacific’s holdings shows not only the growth in stock prices but also increasing inflows on its part. In the same period that its holdings have increased 55 times, the Sensex has gained around two-and-half times. Note also that foreign portfolio investors have bought ₹ 6.22 trillion worth stocks between March 2006 and June 2016. An email sent to the fund did not elicit a reply. EuroPacific’s key holdings include Reliance Industries Ltd ( ₹ 5,944 crore or 1.95% of its market cap), HDFC Bank Ltd ( ₹ 11,666 crore, 4.81% of its market cap) and Eicher Motors Ltd ( ₹ 2,073 crore, 3.97% of its market cap), shows Capitaline data. The EuroPacific Growth Fund is an institutional investor with over $125 billion in assets under management. It primarily invests in European companies or those from the Pacific basin. It also has allocations in Asia, with India’s HDFC Bank being its second largest holding, accounting for 2.2% of its net assets in July-end. EuroPacific is part of a family of mutual funds called American Funds, which, in turn, is owned by the investment management firm Capital Group. International fund tracker Morningstar noted that $10,000 invested in the fund 10 years ago would now be worth $14,674.1. This is higher than the returns of its category ($13,224.04) and the returns of a benchmark index of non-US stocks ($12,372.43). “American Funds’ EuroPacific Growth has a Morningstar analyst rating of Gold because it is adept at taking advantage of the market’s opportunities ... Cash is typically 5-10% of assets, but it has risen to 15% or so during periods of market stress or when the managers can’t find good values. However, this fund isn’t timid either. It often has a sizable chunk of assets in developing market stocks," said Morningstar’s 2015 analyst report. Market tracker Prime Database has compiled a list of India’s largest foreign portfolio investors based on public disclosures. Companies are required to disclose the names of shareholders with more than 1% stake on a quarterly basis. The EuroPacific Growth Fund came out with the highest portfolio value based on these disclosures. Investments which are less than 1% are not disclosed and have not been considered for the analysis. Prime’s list is based on disclosures by 1,517 companies out of the total 1,532 that are listed on the National Stock Exchange. Fifteen companies are yet to come out with disclosures for the June quarter. The portfolio of FPIs whose names are publicly disclosed account for ₹ 4.57 trillion in Indian investments, roughly a quarter of all foreign investments. There are over 5,400 registered FPIs, shows depository data. 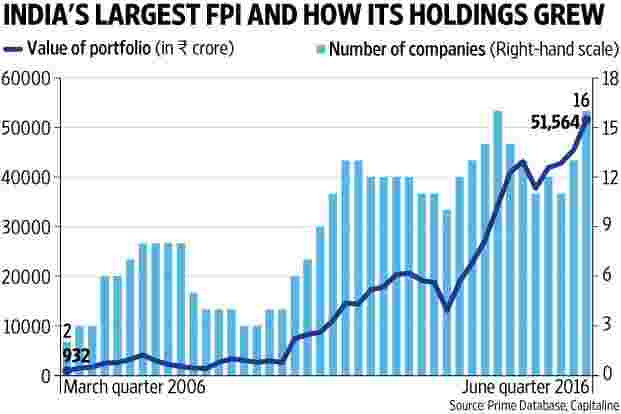 The 10 biggest FPIs account for around a tenth of the total FPI holdings, shows Prime’s statistics. The top five include three sovereign wealth funds. This includes the Government of Singapore, the Abu Dhabi Investment Authority and the Government Pension Fund Global. Sovereign wealth funds are mostly from oil-rich countries. There were apprehensions that they will sell their India holdings after the fall in oil prices. This has not happened. Mint had reported that sovereign wealth fund holdings reached a record level in May. Others in the top ten list include Franklin Templeton Investment Funds, Oppenheimer and Vanguard. Overall, these foreign investors hold 20.09% of the companies’ ownership by value. This is higher than the 19.87% recorded in the previous quarter. This is also the first time that it has crossed the 20% mark since September 2015 (20.56%). “Overall the FPI ownership has shown a rising trend in the latest quarter," Pranav Haldea, managing director, Prime Database, said. A 4 August ICICI Securities India Strategy report noted that foreign flows into India are likely to continue though there may be some volatility. Low interest rates globally, the relative attractiveness of emerging market assets and conducive domestic economic cues are tail winds, according to the note by analysts Ravi Sundar Muthukrishnan, Vinod Karki and Pankaj Chhaochharia.